A Riverdale fan discussion and review popdcast. It's finally arrived, Riverdale Chapter 35 "Brave New World", and Kyle and Noah are here to discuss! Jughead lives, but the Serpents are worse for the wear, and with Sheriff Minetta moving on the White Wyrm, they make their escape to the Northside of Riverdale, welcomed by Archie and Fred Andrews. Betty struggles with the guilt of her father being the Black Hood and understanding the Darkness within her, while Polly makes a mysterious play for the members of The Farm. Veronica attempts to block her father's acquisition of the White Wyrm, striking a deal for Pop's Chock'lit Shoppe. Finally, Archie rallies the students of Riverdale High to keep the Serpents in school, confronts Hiram Lodge about all he knows, and is then struck down as he reaches his peak. All this, plus general thoughts on Season 2, some unapproachable RPG talk, and general plans for Sabrina and Season 3! Thank you all for your support, we look forward to stuff we have planned for the break, the eventual release of Chilling Adventures of Sabrina, and a lot more! Please check out the Party Fowl: The Game of Drunk Ducks kickstarter from our good pals at The Mixed Six! Noah and Kyle are in the penultimate episode of Riverdale Season 2 with Chapter 34 "Judgement Night"! As riots breakout in Riverdale Betty tracks her father, Hal, through the chaos to a final showdown. Archie and Jughead try to keep the peace between the Bulldogs and the Serpents, but the arrival of Penny Peabody and the Ghoulies throws a wrench into the works. Meanwhile, Veronica confronts her mother with evidence of her father's nefarious schemes and the son of Papa Poutine arrives for revenge. All this plus Cheryl wielding a bow, the reveal of the Black Hood, and a sacrifice made in vain! Fatigue sets in for Kyle and Noah in Riverdale Chapter 33 "Shadow of a Doubt". As the return of the Black Hood looms over Riverdale Betty struggles with the realization that her father just might be the man under the hood. Meanwhile, Fangs Fogarty is implicated in the murder of Midge Klump, leading to Jughead and the Serpents having to protect him from Reggie and the Bulldogs, as Hiram Lodge pulls their strings. Archie attempts to ease the tension between the North and Southside factions, driving a further wedge between him and Hiram. Finally, Veronica attempts to use the St.Clair's ransom money to fund a casino in Riverdale. All this plus more Archie cuckoldry and exasperated sighs! Episode 35 The MSBM Double-Feature 3! After a brief break due to sickness we're back with Riverdale Chapters 31 "A Night to Remember" and 32 "Prisoners." As Riverdale High preps for their production of "Carrie: The Musical" the looming threat of the Black Hood returns, ending the life of one poor student. As Riverdale reels in the wake, scumbag Nick St.Clair returns to ransom Archie from the Lodges, and Betty and Jughead discover the truth behind Chic, and possibly the true identity of the Black Hood. 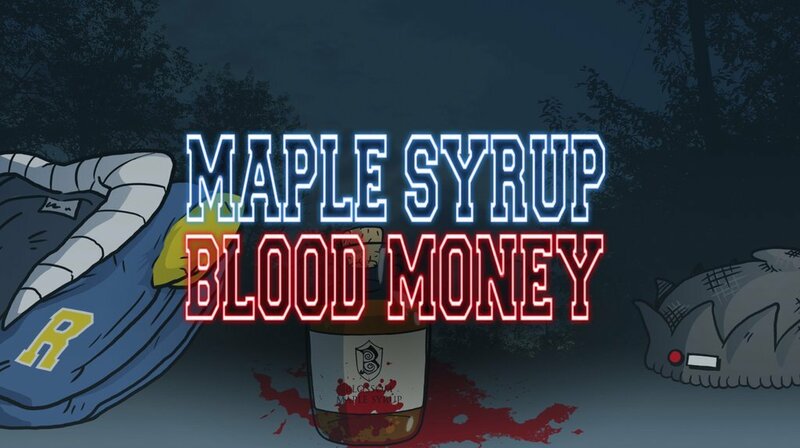 It's Maple Syrup, Blood Money's 1 year anniversary, and Kyle and Noah are here with a new take on Riverdale! Some might call it impenetrable, but we have a good time anyway! Learn about the mystical town of Riverdale and its eldritch underbelly, influencing its citizens for their own nefarious purposes! Listen as the boys plot out a season of dark magic, Horny Evil Gods, and time traveling redheads! Thank you all for a wonderful year of Maple Syrup, Blood Money, we really do appreciate every listen! Kyle and Noah showdown in Outworld for Riverdale Chapter 30 "The Noose Tightens"! While Archie neglects his family obligations to work for Hiram Lodge, the Coopers scramble to deal with the recently rediscovered Shady Man's car and fall prey to a nefarious threat. Meanwhile Toni, Veronica, and Josie confront Penelope Blossom about the recently missing Cheryl, and after receiving a hint from an unlikely source, set out on a stealth mission to free her from The Sisters of Quiet Mercy. Also this episode, the Lin Kuei arrive in Riverdale, Keyhole and Shear sweaters as tactical attire, and methheads! Episode 32 The MSBM Double-Feature 2! After a brief hiatus Noah and Kyle are back for another Double-Feature! The boys cover Riverdale Chapters 28, "There Will Be Blood," and 29, "Primary Colors," back-to-back, delving into the machinations of the Lodge Family and their plans for the Southside of Riverdale. Jughead discovers the Lodges plan to build a For-Profit Prison on the site of Southside High School, while they try to convince Fred Andrews to become Mayor, much to Archie's concern. Betty discovers the truth about Chic, and Cheryl's relationship with Toni grows as a sinister plot boils in Thistlehouse! After a short break Noah and Kyle are back for Riverdale Chapter 27 "The Hills Have Eyes"! While Archie, Jughead, Betty, and Veronica get away to the woods for a horny, horny weekend, and some much needed relaxation, Cheryl deals with her mother's cruel nature and grows closer to an unexpected friend. Meanwhile, Kevin must deal with his loneliness and the sudden revelation from Josie of their parent's affair. Also, prepare yourself for Love, Simon, in theaters March 16th, and some reeeeaaal gross magical items! The blood is on our hands as Noah and Kyle recap Riverdale Chapter 26 "The Tell-Tale Heart." Betty and Alice must rush to hide the body of the Shady Man, leaving Betty to wonder about Chic's true nature. Jughead and FP get drawn into the affair as the Cooper women have nowhere else to turn. Veronica heads off her parent's attempt to discredit Mayor McCoy. Finally, Archie must decide where his loyalties lie; with the mysterious Agent Adams, or with the Lodges, and their underworld dealings.